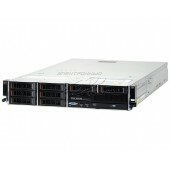 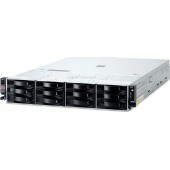 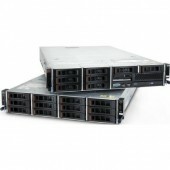 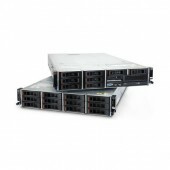 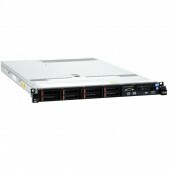 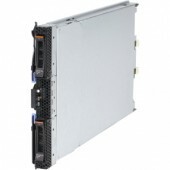 IBM ExpSell x3630 M4 Rack 2U, 1x Xeon E5-2407 4C (2.2GHz/10M/1066MHz), 4GB (1Rx4, 1.35V) RDIMM, noHDD 3.5" HS SAS/SATA (8up), M1115(zm,raid 0/1/10), 2xGbE, DWD-RW, 1x550W HS PSU (2up) (IBM)..
IBM ExpSell x3630 M4 Rack 2U, 1xXeon E5-2420 6C (1.9GHz/15M/1333MHz), 8GB (2Rx4, 1.35V) RDIMM, noHDD 3.5" HS SAS/SATA (8up), M5110 (no cache,nobatt.,raid 0/1/10), 2xGbE, DWD-RW, 1x550W HS PSU (2up) (IBM)..
IBM Express x3630 M4, 1xXeon E5-2407 4C(2.2GHz/10Mb/1066MHz/80W), 1x8GB 1.35V RDIMM, noHDD 3.5" HS SAS/SATA(0/8up), SR M5110 (no cache, raid 0/1/10), Multiburner, 2xGbE, 1x550W (2up) HS PS (IBM)..
Сервер IBM x3630M3 X5650/1x4GB/OBay 3.5 HS SAS/SATA/SR M5015/675W p/s, Rack (737764G) (IBM)..
IBM x3630 M4 Rack 2U, 1xXeon 8C E5-2450 (95W/2.1GHz/1600MHz/20MB), 1x4GB 1.35V RDIMM, noHDD HS 3.5" SAS/SATA (up8), SR M5110 (1Gb flash, raid 0/1/10/5/50), 2xGbE, 1x550W HS PSU (2up) (IBM)..
IBM ExpSell x3630 M3 Rack 2U, 1xXeon E5620 QC (2.4GHz 12MB), 1x4GB Chipkill 1.35V RDIMM, noHDD 3.5" HS SAS/SATA HDD (12up), M5015 512MB w/batt. 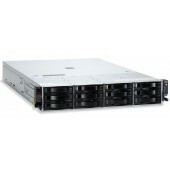 (Raid 0/1/5/10/50), 2xGbE, no ODD, 1x675W HS PS (up2) (IBM)..
IBM Express x3630 M4, 1xXeon E5-2430 6C(2.2GHz/15Mb/1333MHz/95W), 1x8GB 1.35V RDIMM, noHDD 3.5" HS SAS/SATA(0/8up), SR M5110 (512MB flash, raid 0/1/10/5/50), Multiburner, 2xGbE, 1x550W (2up) HS PS (IBM)..
IBM x3630 M3Rack (2U), Xeon 4C E5620 (2.40GHz/1066MHz/12MB), 1x4GB 1.35V RDIMM, noHDD 2.5" HS SAS/SATA (28up), M5014 nobatt (256Mb, raid0/1/10/5/50), 2xGbE, noODD, 1x675W HS PS (up2) (IBM)..
IBM NAS x3630M3 Rack2U, 1xXeon E5620 QC(2.4GHz/12MB),1x8GB 1.35V RDIMM, 300 Gb SAS 10K HDD 2.5" HS(28upSAS/SATA),MS Win St Serv. 2008 R2, M5015 512MB w/batt. (Raid 0/1/5/10/50), 2xGbE, DWDRW,2x675W HS (IBM)..
IBM Express x3630 M4,1x Xeon E5-2440 6C(2.4GHz/15Mb/1333MHz/95W), 2x8GB 1.35V RDIMM, noHDD 3.5" HS SAS/SATA(12/14up), SR M5110 (512MB flash, raid 0/1/10/5/50), noDVD, 2xGbE, 1x750W(up2) HS PS (IBM)..
IBM x3630 M3 Rack (2U), Xeon 4C E5649 (2.53GHz/1333MHz/12MB), 1x4GB 1.35V RDIMM, noHDD 2.5" HS SAS/SATA (28up), M5014 nobatt (256Mb, raid0/1/10/5/50), 2xGbE, noODD, 1x675W HS PS (up2) (IBM)..
IBM ExpSel x3630 M3 Rack 2U, 2xXeon X5650 6C (2.66GHz 12MB), 2x4GB 1.35V RDIMM, noHDD HS 3.5" SAS/SATA (14up), M5015 512MB w/battery (Raid 0/1/5/10/50), 2x1GbE, noDVD, 1x675W HS PS (up2) (IBM)..
IBM x3630 M4 Rack 2U, 1xXeon 6C E5-2430 (95W/2.2GHz/1333MHz/15MB), 1x 4GB 1.35V RDIMM, noHDD HS 3.5" SATA (up14), SR M5110 (no cache,nobatt.,raid 0/1/10), 2xGbE, 1x750W HS (up2) (IBM)..
Сервер IBM System x3630 M4 оснащен процессором Intel® Xeon® E5 2470 частотой 2.3 ГГц, 8 Гб оперативной памяти DDR3 Reg, RAID контроллером ServeRaid M5110, поддерживаются диски SATA/SAS формата 3.5``, возможность установки до 14 дисков (2 диска монтируются с задней стороны), интегрированный видео кон..